I bookmarked this recipe long before from Rak's Kitchen. Now only i got the opportunity to do this recipe.Sweet potatoes are not only tasty and they are good for our health too.My and my husband never mind to eat nutritious vegetables in any farm.I made this dinner roll with left over sweet potato.This dinner role is moist and dense.Original recipe used 2 cups of all purpose flour,but i replaced it with 1 cup of wheat flour. Steam / pressure cook the sweet potato. Peel the skin and mash. In a 1/4 cup of warm water add sugar and yeast mix well. Keep it for 10 minutes and it should be raised. If not yeast is not active don't proceed further. Add olive oil ,milk to sweet potato and mix well as smooth. In a separate bowl ,take both flours ,add salt and mix well. Make dint in the middle,add yeast mix and mix well. Then add sweet potato mix and make soft and elastic dough.It will take 8 -10 minutes. Cover the bowl with cling wrap and keep it aside for an hour in a warm place. After an hour, the dough will be raised double in volume .Punch down and knead again. Divide the dough into equal sized balls and arrange in a greased baking tray. Preheat the oven to 400F.Bake it for 12 - 15 Minutes. Take it out brush it with butter and bake again for 5 - 8 minutes until top become golden brown. 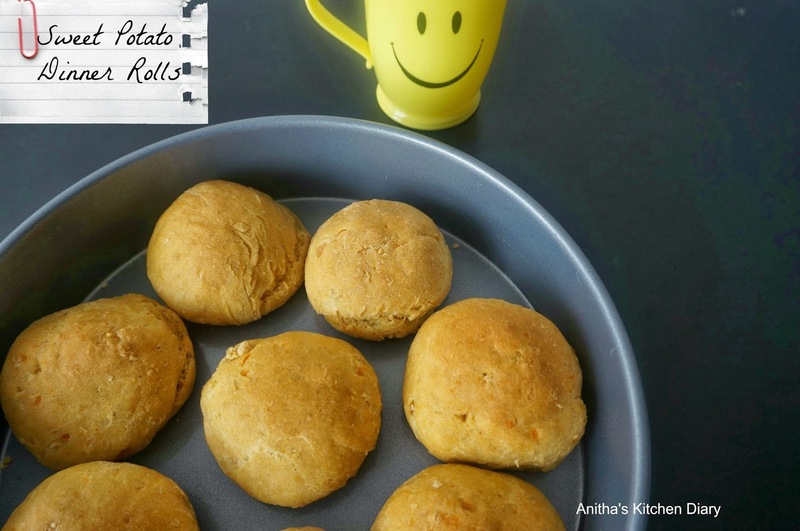 Sweet potato buns are ready to serve.Serve it for break fast or dinner with butter and jam.